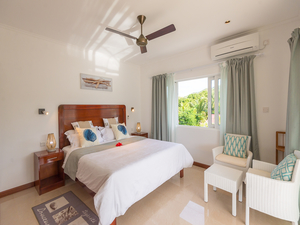 Tropic Villa Annex is the sister establishment of Le Tropique Villa which is also located at Amitie on Praslin Island which is just opposite Le Tropique Villa. Guests staying at Tropic Villa Annex can go to the beach at Le Tropique Villa and use the facilities like beach beds which is at the property, as Tropic Villa Annex is Garden View only it is not located on the beach. 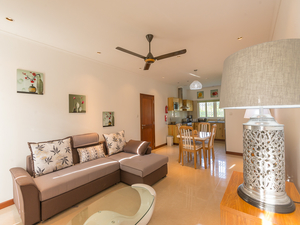 Tropic Villa Annex comprises of 2 Two Bedroom Apartment; one on the upper floor and the other on the ground floor. Both apartments has one bedroom with adjoining single beds and another bedroom with a king size bed which therefore allows a max. of 4 person to stay in the apartment. Both apartment are equipped with air-conditioning, TV with International Channels, private bathroom, and a fully equipped kitchen to prepare your food of choice. STAY FOR 10 NIGHTS AND GET 1 NIGHT FREE! 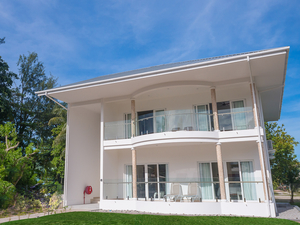 Click here to view more photos of Tropic Villa Annex. © 2016 Le Tropique Villa. All rights reserved.